While a fresh coat of color can quickly update any room, the crisp lines where your walls meet trim or ceiling are really what set apart a stand-out paint job. Read on for how to achieve such a professional touch on your next project. Any professional painter knows that a successful paint job is only as good as the preparation that comes before it. That’s why it’s so important to cut in around trim, ceilings, and baseboards before you start rolling paint on the walls. Lucky for us, even the average DIYer can do this well with the right equipment, a little instruction, and some careful application of paint. Even when you’re dealing with the small amount of paint required for cutting in, drips and spills can happen. So, begin by prepping the room, making sure that floors and other surfaces are protected. Always use a drop cloth, and move it as you work through the room. Use painter’s tape to mask only those awkward or tough-to-reach spots where you know you won’t be able to guarantee clean results without taping. Otherwise, avoid taping—it takes extra time, and unless the tape is properly applied, paint can seep underneath it or dry on top of it, creating a real mess upon removal. Get ready to paint by loading the brush. Pour about 2 inches of paint into the bucket. Hold your brush with a pencil grip, with the longer side of the brush bristles in line with your pointer finger. 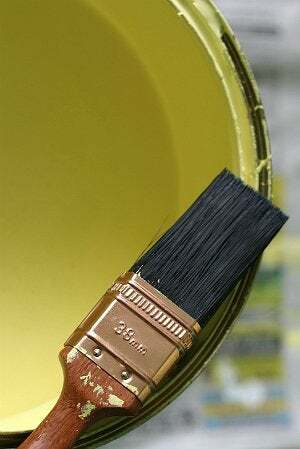 Dip the brush into the paint, but be careful not to load more than 2/3 the length of the bristles with paint. Gently tap the brush against the side of the bucket to remove any excess. Now it’s time to get some paint on that wall! Begin about an inch away from the area you’re cutting in, whether you’re working along the trim or down a corner. Holding the brush horizontal with respect to the floor and ceiling, paint a roughly 12-inch stripe on the wall, using a downward stroke if you’re painting at a corner, or a sideways stroke if you’re working along the ceiling, baseboard, or other trim. Now that you’ve used up some of the paint on your brush, turn your brush 90 degrees so that it angles into the wall, and go back to the beginning of your stroke. This time, using long, even strokes, cut in a thinner line of paint that gets right up to the trim or wall corner. Once you’re satisfied that you have a cleanly painted edge or corner, again turn your paintbrush horizontal to the floor and ceiling, and gently sweep back over the area to erase brush marks and feather the outer boundaries of the painted area. Doing so will ensure a smooth, seamless finish after you’ve rolled the walls. Continue to work your way around the room, gently overlapping sections to keep a wet edge. 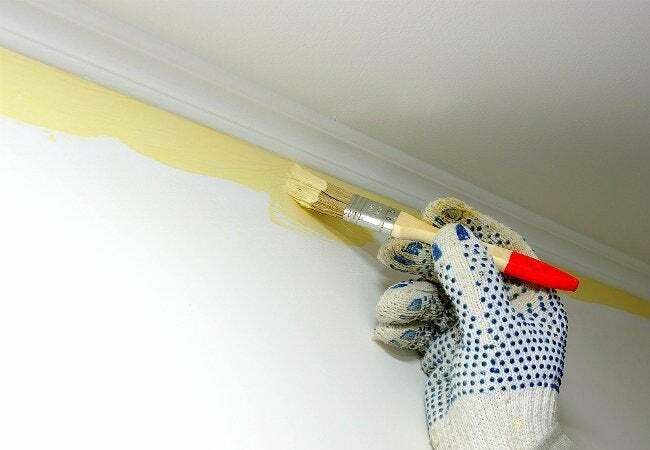 If you have an accidental drip or get paint on the trim or baseboard, wrap a damp cloth around a spackling knife or the long edge of a 5-in-1 painter’s tool, then run it along your paint line to remove any excess. Cutting in does take practice, but taking the time to cut in neatly will make a huge difference in the appearance of your newly painted room. • Use a light touch. Applying too much pressure on your strokes will cause the paint to ooze out of your brush and drip. • Don’t load the brush with too much paint. This will result in drips and heavy lines on the walls, and you’ll risk getting the bristles of your brush caked with dried, crusty paint. • Use a high-quality brush. It’s well worth investing in a high-quality cutting in paintbrush. The better the brush, the less taping you’ll need to do, making the job go more quickly and with less frustration.